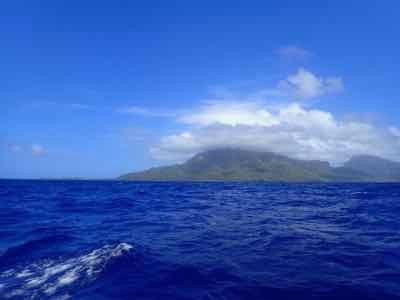 Our next island, Moorea, is within sight of Papeete and the crossing took just a couple of hours. 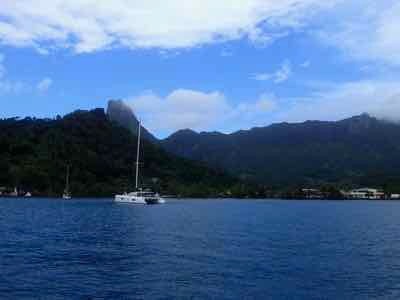 The weather was good when we passed through the barrier reef into Cook’s Bay. 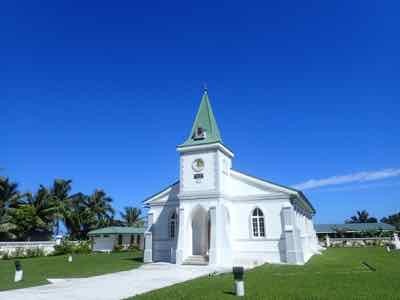 Incidentally Cook never anchored here, he went to Opunohu Bay instead, just a short distance away. He probably would have stopped here had he realised it would later bear his name. 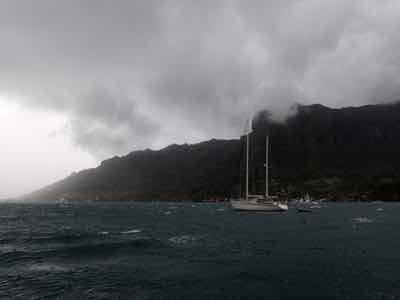 As we were about to drop the anchor a squall came out of nowhere, the water in the bay turned white and the heavens opened up. We seem to be making a habit of arriving in filthy weather. In the strong gusts, our anchor skidded along the bottom, unable to take hold and Caramor raced towards the shallows, blown by the wind. Reaching for waterproofs in these conditions is pointless, we’d be as wet from our sweat as from the rain so instead, I took all my clothes off, which was warmer than getting wet through. As usual the squall didn’t last long, on the second attempt the anchor bit and the sun came out once again. 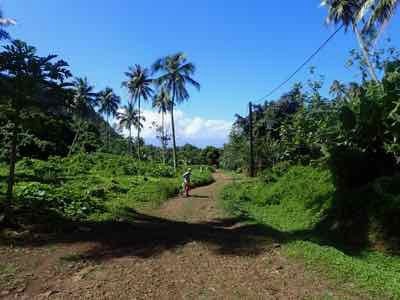 The next morning we paddled the dinghy to the beach where the outrigger canoes are kept and tied it to a banana tree. We unfolded the bikes, much to the curiosity of a few local lads hanging around. 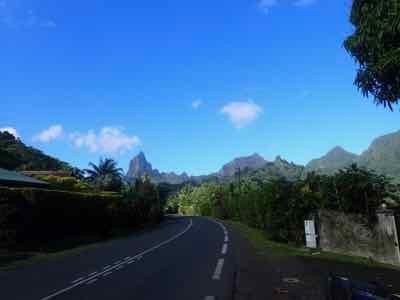 Moorea has a road that goes all the way around its perimeter, a total distance of 60km and our plan was to spend two fun days circum-cycling the island. 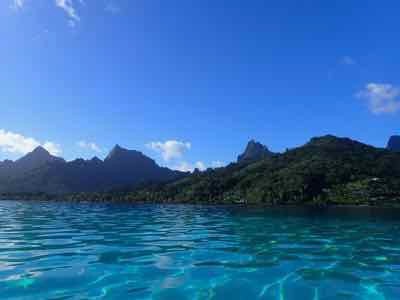 I had in mind a ‘gourmet tour’ of Moorea; morning coffee at a deli food wagon, lunch at one of the posh hotel restaurants, then an ice-cream or French patisserie somewhere on the other side of the island. 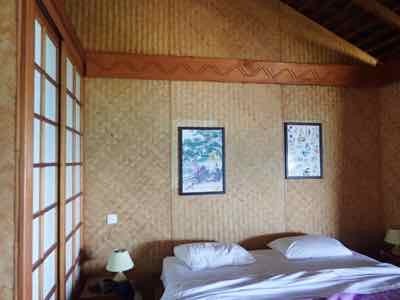 We’d booked accommodation near Haapiti and I was anticipating that we could go out to a local restaurant, maybe try a Polynesian speciality, then tomorrow, more of the same. It was Sunday. We started peddling at 8:20 and although we stopped frequently to admire the splendid view, we were covering the ground rather fast. The deli food wagon was shut and none of the restaurants opened before 11:30. The further around the island we went the fewer options we had. 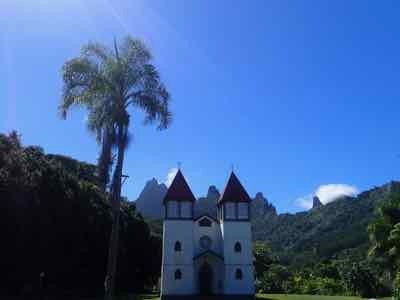 By a quarter to twelve, Franco was looking distinctively hungry and we were nearing Haapiti. I’d told the landlady that we wouldn’t be arriving until 4pm and as far as I knew she didn’t serve any food. Around the next bend, two lads by the side of the road were selling firi-firis. “Let’s buy some,” I said to Franco. “But I don’t know what they are.” He replied. “It’s food. And we don’t know if we will find anything else.” I explained. ‘Firi-firis’ turned out to be an unsweetened donut made with coconut milk. We bought a bag, it contained six large figure 8 shaped donuts and we ate the lot. Franco usually hates donuts but he tucked in with gusto. “Nice.” He said. A sign of how desperate the situation was becoming. Nobody seemed to live in the village anymore, all the houses were along the road. We came to a shop which was open. Most of the shelves were empty but it did have a well-stocked section of corned beef (a staple here) and beer (another staple) and a table in the middle with freshly prepared food: pizzas and quiches and a few pains au chocolat left over from the morning. Franco bought a slice of pizza for lunch. There were lots of teenagers hanging around on bicycles. All of them could do neat stunts such as cycling down the road on one wheel or cycling down the road backwards. Most likely a sign that there isn’t a lot else to do in Haapiti. The accommodation, Tehuarupe, we had booked turned out to be fabulous, in fact we had a whole cabin to ourselves, including a kitchen and a very large bed - what luxury (no offence Caramor!). The idea was that guests self-cater but we hadn’t brought any food. The landlady suggested we might find a food wagon ten minutes down the road selling chowmein. Just in case we didn’t, I returned to the store and bought two more slices of pizza. 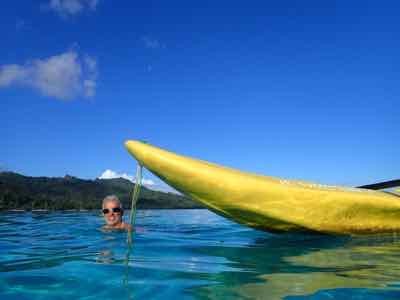 We waited for the sun to drop a little and borrowed a ‘banana’ (she called it a kayak) and went for a paddle and a swim in the lagoon. 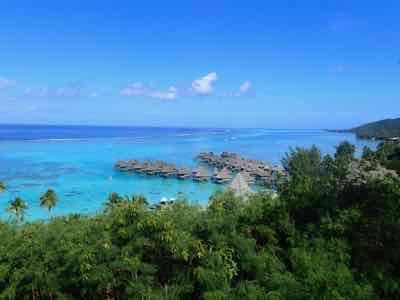 The shore was mangrove swamp, not something we had seen before in French Polynesia. After dark we cycled along the road and found the food wagon. It sold pizza and donuts. The ‘gourmet trail’ was rapidly becoming the ‘pizza marathon’. Franco, feeling hungry, had insisted we order one each, the box seeming deceptively small. After dinner we still had three quarters of a pizza left and the two slices I had bought earlier. 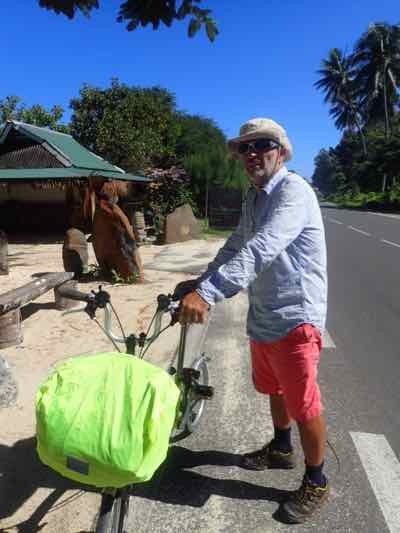 The next morning we got going at a more leisurely pace, determined not to blow our thirty kilometres before lunch. By then we hadn’t had coffee for more than thirty-six hours and Franco was beginning to shake. In Afareaitu, the island’s administrative centre, we found a store selling tins of iced Nescafé and we stooped as low as to drink a can. Here we turned left, inland, hoping to find the path to a couple of reputedly spectacular waterfalls. After 200m we were on a gravel road and 200m further we turned onto a dirt track. Soon we were pushing the bikes. A woman tending her plot called out to us. We padlocked them to a banana tree and chatted with our new acquaintance. She told us there was a lot of stealing going on in the town (the main road just 400m away) and from talking to her we gained the impression that we were deep in the countryside. Even though we hadn’t gone far, the climate had changed from the coastal road, the moisture had increased and were dripping with perspiration without even moving. Equipped with this knowledge we set off. We walked steeply uphill for quite some time but never found the waterfalls, then the semblance of a path disappeared altogether. By then Franco was grumping, somehow he had imagined it to be a mere thirty minutes detour, not a full-on jungle bash. There’s no pleasing some! We returned to the bikes and sadly the dogs hadn’t eaten the pizza even though I’d told them about it and left the bag open. 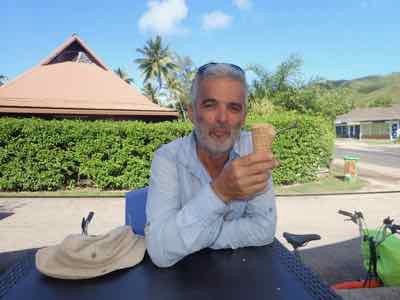 As we approached the eastern side of the island and the ferry port to Papeete, road side restaurants started to appear, every single one of them sold pizza. The road climbed up to the look-out point above the Sofitel resort. 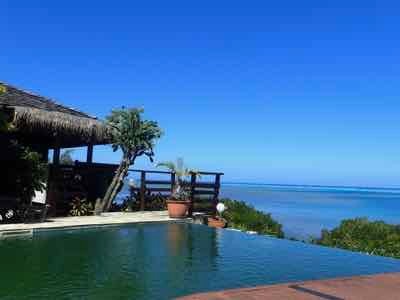 All the resorts look the same and local villages look nothing like the resorts. I had one ace up my sleeve, the Lollipop ice-cream parlour and luck was with us, it was open. 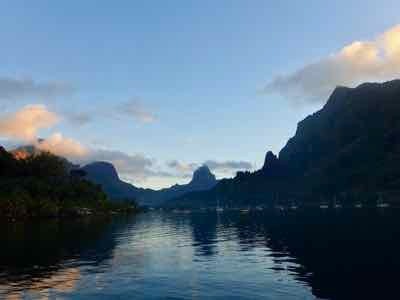 We were nearing Cook’s Bay, the end of our journey, and as on all the other French Polynesian islands we have visited, were had been struck by the total absence of litter along the road. 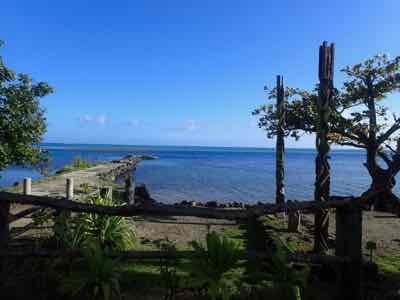 Our last stop was at the unpretentiously named Moorea Beach Café. According to the Lonely Planet guide, it served excellent affordable food. We were disappointed to find that it was now sponsored by some widow into French champagne and that the celebrity chef had done a deal on a shipload of truffles, they were in every dish on the menu. They may add a ‘je-ne-sais-quoi’ to the flavour but they certainly double the zeros on the bill. Besides, we still had pizza for dinner.